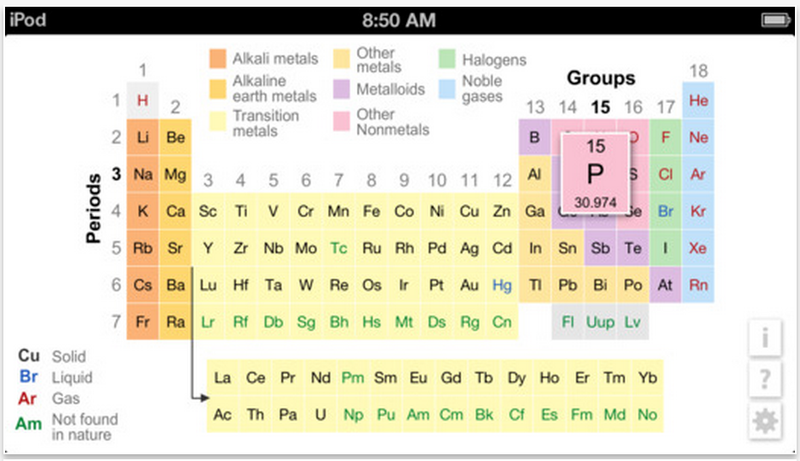 K12 Periodic Table of the Elements is a great iPad app for Science teachers and students. As its name indicate, this app allows students to explore the elements together with their key attributes in a simple and easy to use way. 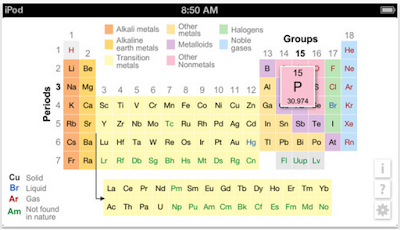 K12 Periodic Table of the Elements, created by K12 Inc as part of its comprehensive Science curriculum, is particularly idea for helping students with their science homework. Improved swipe and touch functions display element details such as name, symbol, atomic number, atomic mass, Lewis dots, and radius. Colors change in the table to show classification, melting point, boiling point, outermost orbital, radius, ion radius, electronegativity, and ionization energy. Temperatures are shown in Kelvin, Celsius, and Fahrenheit scales. The table includes the newly named elements Darmstadtium (110), Roentgenium (111), Copernicium (112), and Ununhexium (116). Both traditional and expanded views of the table are available on some tablet devices. The table matches the style and format of the table in K12's award-winning Chemistry: Problems and Solutions textbook.